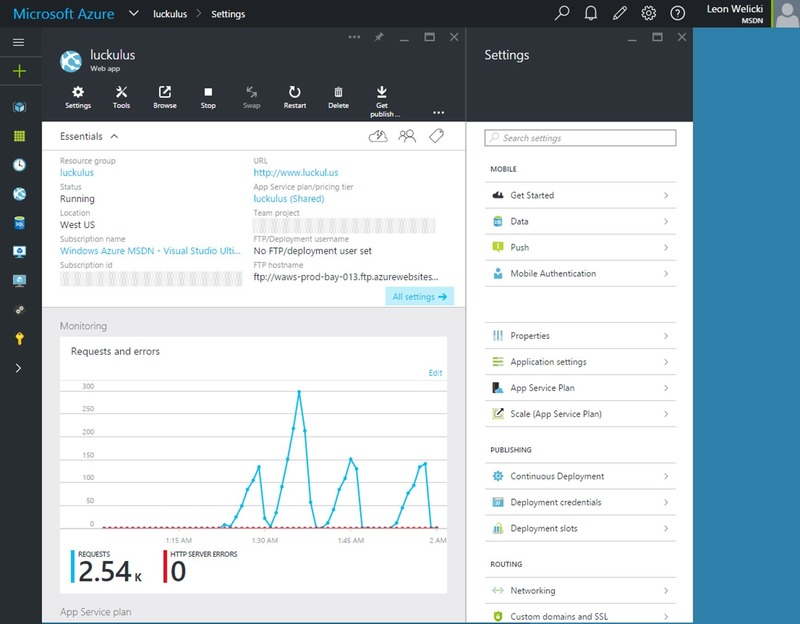 Today we’re proud to announce a set of improvements to the Azure Preview Portal. Like last time, all these enhancements are in response to the great feedback we’ve received from you. We’re very grateful for your feedback and look forward to more of it! We improved the main navigation experience to make common flows more effective based both on what you have been telling us and how you use the portal. One of our key goals is to make it easier and faster for you to find resources that are important to you (Web Apps, Virtual Machines, etc.) and perform tasks on them. We’ve considerably reduced the amount of clicks to perform the most common flows in the process. 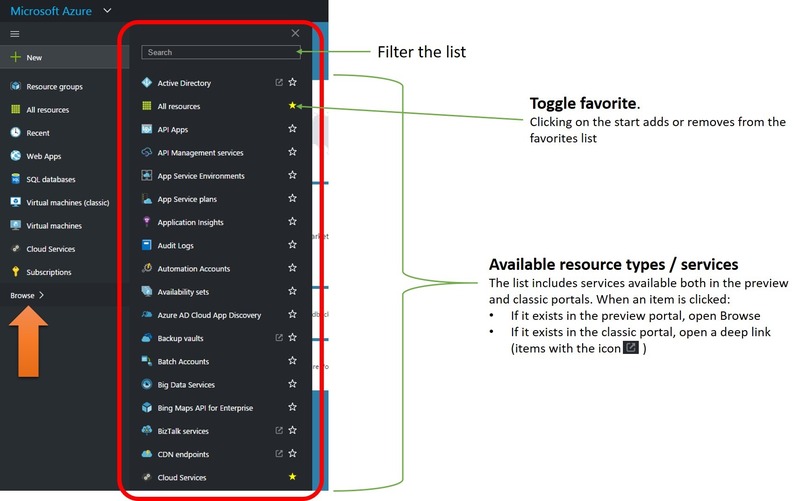 The left bar is the key navigation artifact to access your resources and tools. The left bar functions are always available at the left of the screen, no matter what you are doing or where you are in the portal. The menu icon at the top allows expanding or collapsing the left bar. This gives you control over screen real estate without losing functionality. 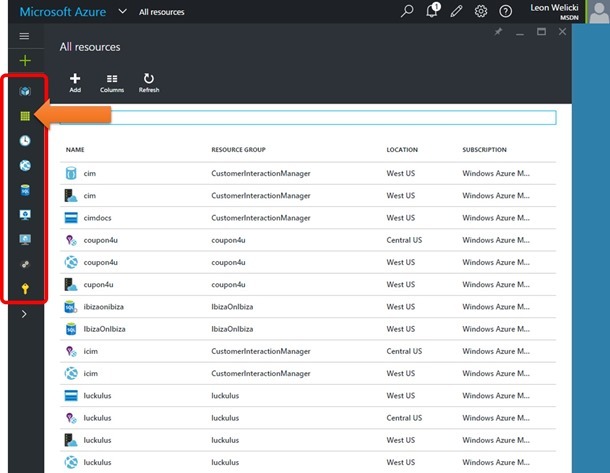 To create a resource, the + New item at the top gives access to the marketplace and all Azure offerings, just like in the previous navigation experience. 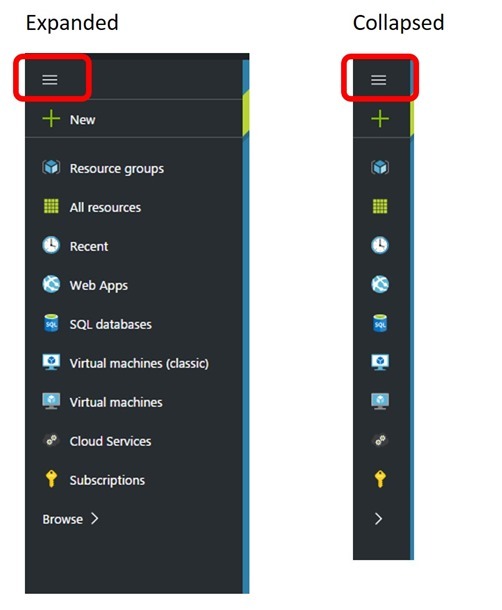 The Favorites section is fully customizable and provides direct access to your favorite Azure Services. Clicking on any item in the list opens the browse blade for the associated service. 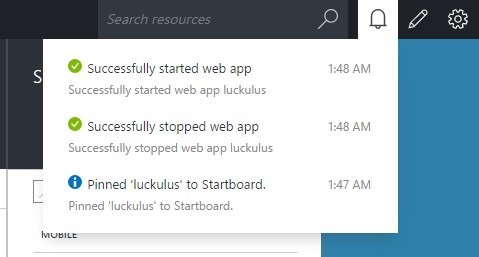 The image below shows the result of clicking the All resources view. We pre-populated the favorites list with some of the most-used services. If these are not what you use most, you have full control over the list and can add, remove or reorder items! The list contains all services available on Azure (both in the classic and preview portals). The list can be filtered by service name. Every item can be added or removed to favorites using the star icon to the right of the name. Items available in the preview portal open the Browse experience for the associated resource. Items available in the classic portal show a special icon and deep link to the classic portal. Pro tip: You can get the Browse services list using the B keyboard shortcut. The top bar provides access to key portal functions. Functions that are always available, no matter what you’re doing or where you are in the portal. 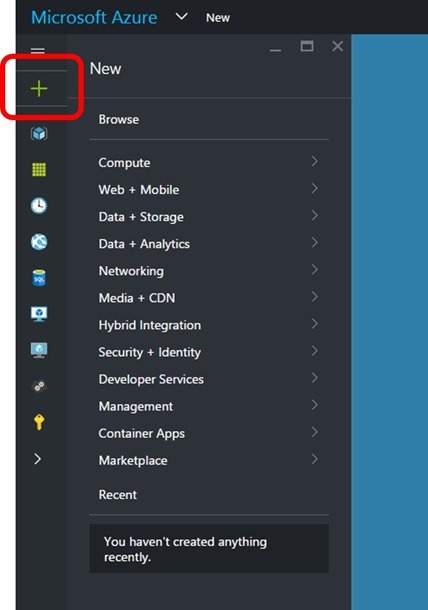 Clicking on the text Microsoft Azure takes you to the dashboard. If you are not in the dashboard, the breadcrumbs provide information about all the blades you visited and help you navigate through (clicking on the name of a blade brings it to focus). Switching tasks (aka Active/Journeys) is represented as a dropdown of breadcrumbs to better represent the intent, as shown in the image below. We introduced a search box in the top bar that allows you to search for resources in all subscriptions you have access to. The search box is always available. Pro tip: You can set the focus in the search box using the / keyboard shortcut. We moved notifications to the top right corner. Clicking on the notifications icon shows a dropdown with notifications. Each notification can be clicked to open a blade with more details. The top bar provides access to common support functionality. Both Customize (enter customization mode to move, resize and add tiles) and Settings (change language, theme, across the portal, etc.) are accessible from the top bar. The account menu works the same as it previously did in that you can logout, change directories or jump to the classic portal. To get the full list of shortcuts just press ? and you’ll get a help panel with all the shortcuts! Resource blades are the blades that surface Azure resources like Websites, VMs, SQL Databases, etc. 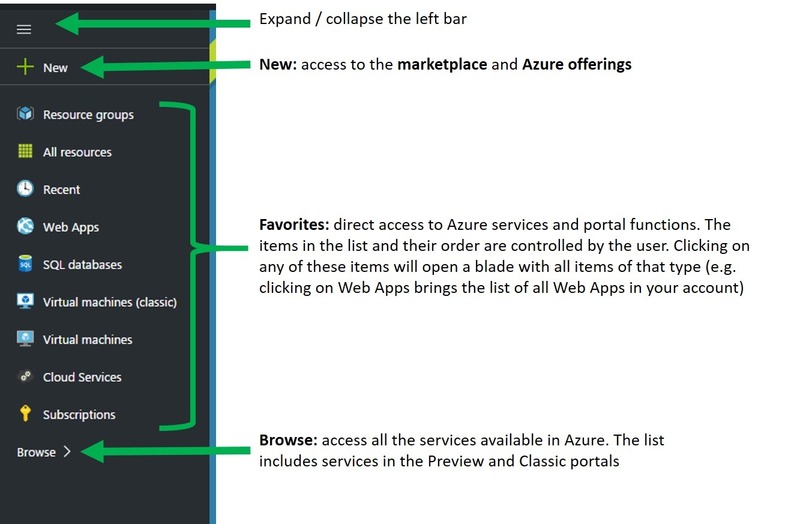 They are a common starting point or destination when you use the Azure portal. In the past we made improvements like Essentials and Settings that simplified and standardized the experience for managing different types of resources. We found a very high correlation between opening the Resource blade and its associated Settings blade: Most customers who open a resource blade most often open its associated settings blade. That said, we are opening both at the same time to make those settings available as soon as you access the resource. In addition, we changed the style in the settings blade to improve information density and added support for grouping (which will progressively become available for more resources in the upcoming weeks). Some resources expose a Move command that allow you to move them to another resource group or subscription. The image below shows an example of the experience for the SQL Server blade. This capability is currently available for SQL Server, DocumentDB, Search, Data Factory and Batch. In the upcoming weeks more services will include this functionality. The Azure Preview Portal has very powerful customization capabilities allowing you to personalize it to match how you work. The tiles in the dashboard and resource blades can be resized, moved and removed. In addition, you can add new tiles to the resource blades. To customize a tile, hover over it and leave the mouse there for about a second. That will display the customization options in a blue bar at the top of the tile. Remove the tile clicking the X.
Resize the tile selecting a new size. Move the tile around, dragging it from its top bar (you’ll notice the drag handle). Note: Once you resize or move a tile, the portal will automatically enter customization mode. This option is also available as a button in the top bar allowing you to easily move, resize, or remove other tiles. To exit customization mode, click the Done button at the top, any part of the dashboard background or just hit the ESC key. Improved performance. This is a main area of focus for our team. We’ve made a lot of improvements in this space and we know there’s work ahead of us, but we are working hard on this! 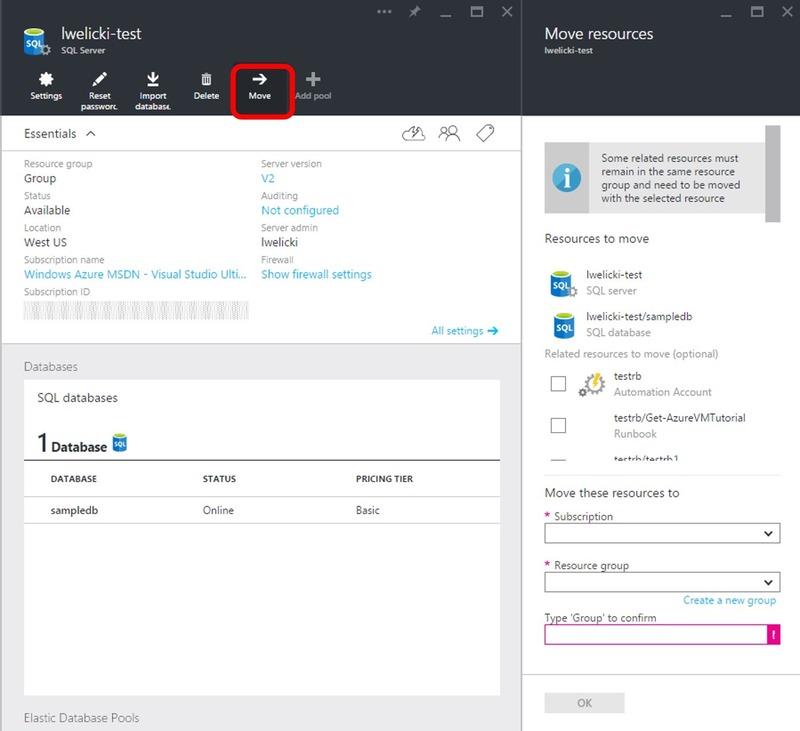 Expand coverage of move a resource to another resource group/subscription functionality. 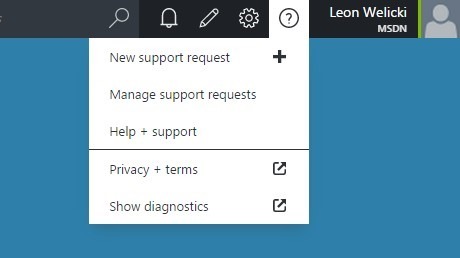 Improved integration support within the portal. I’d like to close with a big thanks to YOU. Your feedback has driven the work for this update and all the work we are currently doing.